What Debts Can I Eliminate Through Bankruptcy? ELIMINATING YOUR DEBT and obtaining a financial fresh start are the primary goals of filing for bankruptcy protection. Understanding what debts can be discharged in bankruptcy is critical, to ensure that you are able to obtain the financial fresh start that you desire. ALL COLLECTION ACTIVITY MUST STOP regarding all of your debts immediately upon filing your bankruptcy case with the court. This automatic protection initially goes into effect against every debt, regardless of whether or not the debt can or cannot be eliminated in bankruptcy. 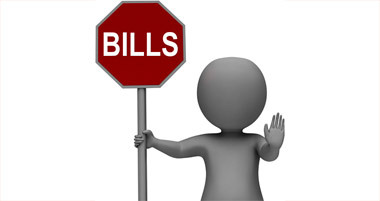 Creditors can no longer call, write, continue with court cases, and cannot continue to garnish wages or bank accounts. ALL collection activity must stop as soon as your bankruptcy case is filed. ALL DEBTS THAT CAN BE ELIMINATED through the bankruptcy are forbidden from every type of collection on the debts once the bankruptcy court issues your bankruptcy discharge. Legally, creditors are permanently enjoined from collection efforts. This means that the creditor cannot call you, cannot write you, cannot sue you, cannot garnish you, and cannot report that you owe the discharged balance on your credit reports. The permanent injunction provides you with the financial fresh start that you desire. THE BANKRUPTCY ATTORNEYS AND LAWYERS at Barr, Jones & Associates can help ensure that the automatic stay is properly applied to your case. Our bankruptcy attorneys and lawyers can ensure that all creditors honor the automatic stay. We will navigate the bankruptcy process with you. Our goal is to ensure that you receive your bankruptcy discharge. Once the discharge is received, we can help you enforce protection against creditors that are not honoring it. Bankruptcy is a very complex area of law. Do not leave such an important matter in your life in the hands of an attorney that does not have the experience needed to do the job right. Our attorneys have the experience and reputation necessary to properly handle your case. Call today for your free telephone consultation to determine how the law firm of Barr, Jones & Associates can help you get back on the road to a financial fresh start.